The family Alberti has a long entrepreneurial tradition beginning from the early 1700 with agricultural and commercial activities. 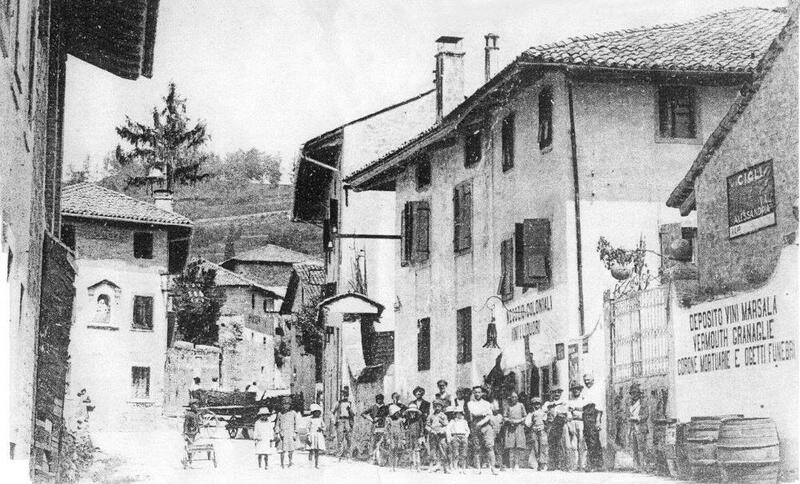 Alberti Luigi created in 1875 in the near village of Fagagna, the activity of “commerce of colonial imports, cereals, spices, cured meats and wines.” Alberti Osvaldo (Luigi’s child) in 1906 transferred the firm to San Daniele del Friuli, taking into account that the commercial exchanges in this town were better organized. Osvaldo immediately expanded the business, offering also the transport of food products through horse-drawn carriages, as well as trading of essential goods. 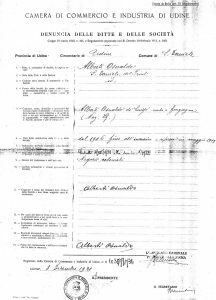 At that time, but especially during the war events of 1914-1918, the figure of the merchant was really important, also because there was a shortage of money that was often replaced with the “barter”. In practice, Osvaldo was able to supply various goods distributing wholesale and retailing, but since there was no money in circulation, he accepted as compensation for the corresponding quantities products of the earth such as cereals, wood and animals. From these exchanges, a flourishing exchange of farm animals, pigs, cattle and so on developed to create a well-known trading center for the entire hilly area. The Alberti company provided both products and services to the first butcher Social Cooperative that was always located in San Daniele. After the crisis of 1929 the Alberti company had serious difficulties but Osvaldo always held the reins of the business. We reach the years 1930/40, an era in which the exchange became more and more specific within the pig; it is precisely in these years that Osvaldo organized himself systematically to work the products derived from pork and in particular using the thighs of the “black pigs” coming from neighboring Fagagna. From the marriage of Osvaldo with Vidoni Anna, Maria, Teresa and Napoleone were born. 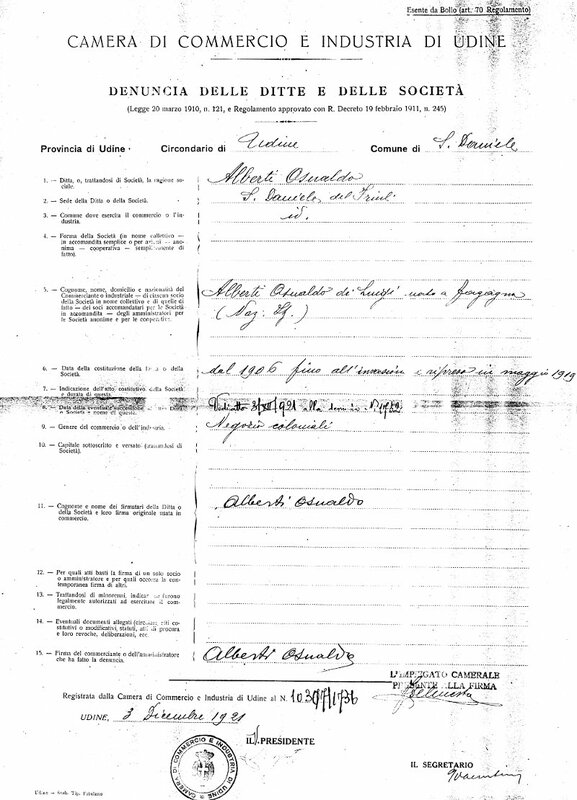 The two females marrying left San Daniele, while Alberti Napoleone had to enlist and fight in the Second World War, even remaining a prisoner for 7 years. 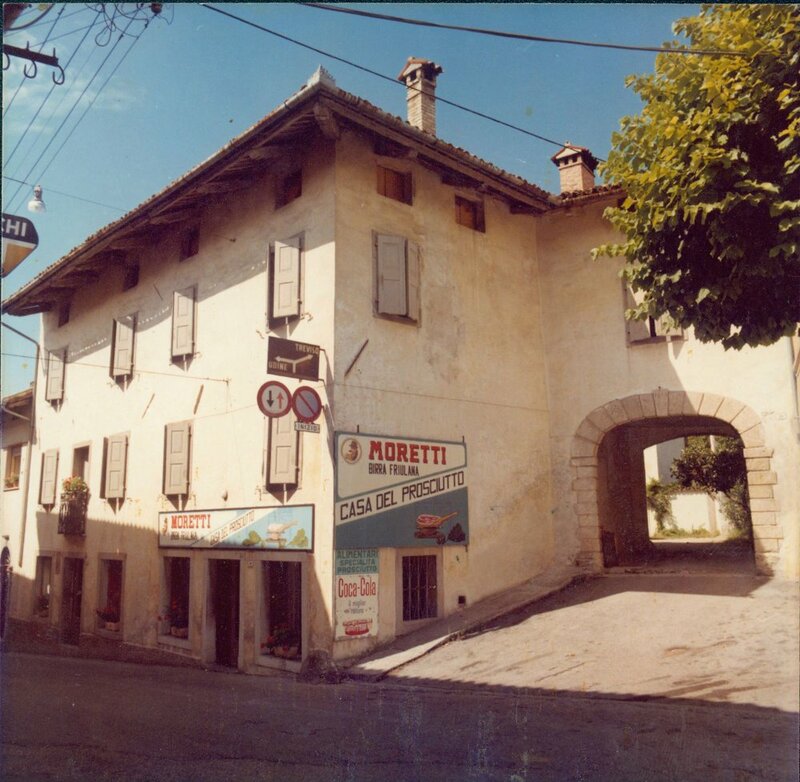 Returning from his imprisonment, Napoleon met his future companion Caterina Castellani, who at the time worked in the family farm, located in the nearby village of Cimano and also at the old Osteria Moretti in the center of San Daniele. Caterina and Naoleone married in 1951. Osvaldo, taking into account the entrepreneurial character and the willpower of his daughter-in-law Caterina, decided in 1954 to entrust the reins of the company to her also because her son Napoleon decided to do a different job, called “daziere”. In 1963 Castellani Caterina created, patented and registered the brand “La Casa del Prosciutto”. We reach the 70s, when the seismic events of 1976 caused considerable damages to the structures of the company, demolishing several sectors of it. Despite the difficulties, Castellani Caterina decided to immediately complete the reconstruction works in such a way as to re-open as soon as possible the ham factory, the shop and also the tavern, transforming it into a specific room for the tasting of San Daniele ham. The following years were characterized by a continuous purchase of buildings, creating the basis for the construction of a production facility organized and approved to community regulations in the historic center of San Daniele del Friuli. 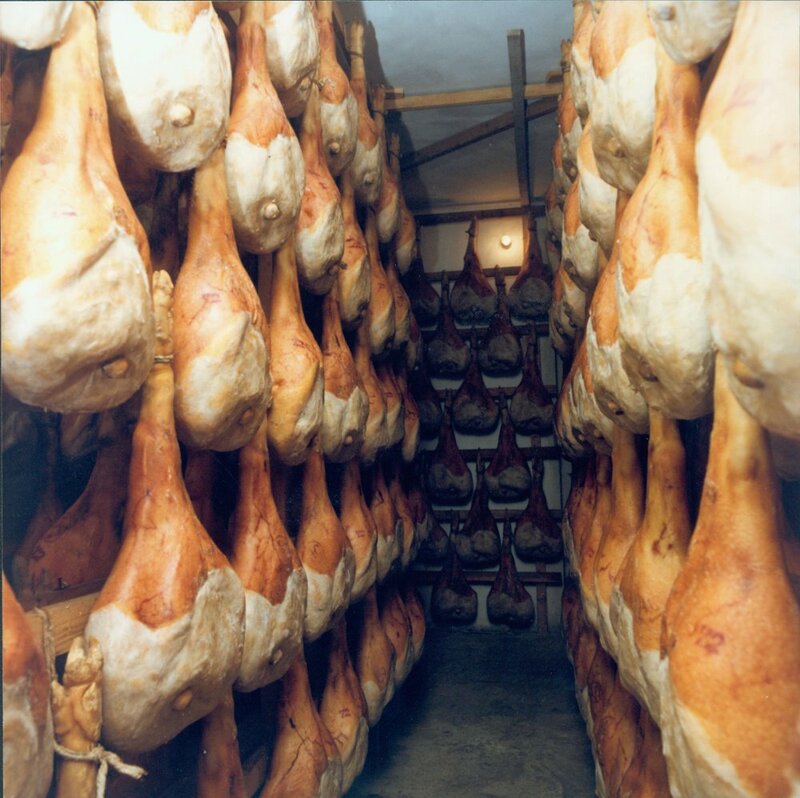 In the 90s La Casa del Prosciutto, after an important building intervention, was further modernized and expanded, bringing the production to about 12,000 pieces per year. Since 2013, the reins of the company have passed entirely to Carlo Alberti, who, after a new plant renovation, has renewed the entire business complex, providing the plant with the latest technologies for a total energy optimization, involving in the renovation also the sons Marco and Luca, who now represent the fifth generation of the company.